Ang, B.-K., and Chung, B.-K. (2007). A Wideband E-Shaped Microstrip Patch Antenna for 5-6 GHz Wireless Communications, Progress in Electromagnetics Research – PIER, vol. 75, pp. 397-407. Archevapanich, T., Nakasuwan, J., Songthanapitak, N., Anantrasirichai, N., and Wakabayashi, T. (2007). E-Shaped Slot Antenna for WLAN Applications, PIERS Online, vol. 3, no. 7, pp. 1119-1123. Balanis, C.A. (2005). Antenna Theory Analysis and Design, John Wiley & Sons, New York. Bhattacharyya, A.K., Shafai, L and Gary, R. (1991). Microstrip Antenna – A Generalized Transmission Line, Progress in Electromagnetic Research, vol. 4, pp. 45-84. Carver, K. and Mink, J.W. (1981). Microstrip Antenna Technology, IEEE Transactions on Antennas and Propagation, vol. 29, pp.2-24. Faiza, Z., Ali, M.T., Subahir S., and Yusof A.L. (2012). Design of Reconfigurable Dual- Band E-Shaped Microstrip Patch Antenna, International Conference on Computer and Communication Engineering (ICCCE 2012), pp. 113-117. Gaur, N. and Soni, D. (2012). E-Shaped Slotted Microstrip Antenna with Enhanced Gain for Wireless Communication, International Journal of Electronics and Computer Science Engineering, vol. 1, no. 2, pp. 436-441. Guterman, J., Moreira, A.A., Peixeiro C., and Rahmat-Samii, Y. (2009). Reconfigurable E- Shaped Patch Antennas, IEEE International Workshop on Antenna Technology (iWAT 2009), pp. 1-3. Günel, T. (2011). Modified Resonant Frequency Calculation for E-Shaped and H-Shaped Microstrip Patch Antennas, Microwave and Optical Technology Letters, vol. 53, no. 10, pp. 2348-2351. Kumar, G. and Gupta, K.C. (1985). Directly coupled multiple resonator wide band microstrip antenna, IEEE Transactions on Antennas and Propagation, vol. AP-33, pp. 588-593. Lin, W., Xie, X.-Q., Bo, Y., and Feng, L. (2011). Design of a broadband E-shaped microstrip antenna, 2011 Cross Strait Quad-Regional Radio Science and Wireless Technology Conference, pp. 386-388. Patel, S.S., Soni, H.B., Patel, S.K., and Kosta, Y.P. (2011). E-shaped Patch Antenna Analysis for Multiple Applications, 2011 3rd International Conference on Electronics Computer Technology (ICECT), vol. 5, pp. 258-263. Pozar, D.M. (1992). Microstrip Antennas, Proceedings of the IEEE, vol. 80, no. 1, pp. 79- 81. Rao, G.P., Agarwal, K., Kartikeyan M.V., and Thumm, M. K. (2006). Wideband Single Patch E-Shaped Compact Microstrip Antenna for High Speed Wireless Local Area Networks”, German Microwave Conference, pp. 1-3. Sullivan, P.L. and Schaubert, D.H. (1986). Analysis of An Aperture Coupled Microstrip Antenna, IEEE Transactions on Antennas and Propagation, vol. 34, pp. 977-984. Tansarıkaya, İ. (2007). Geniş Bandlı Yama Anten Tasarımı, Yüksek Lisans Tezi, İstanbul Teknik Üniversitesi Fen Bilimleri Enstitüsü. Toktaş, A. ve Akdağlı, A. (2012). E Şekilli Kompakt Mikroşerit Antenlerin Rezonans Frekansının Hesaplanması, Gazi Üniversitesi Mühendislik Mimarlık Fakültesi Dergisi, cilt 27, no. 4, 847-854. Virga, K.L. and Rahmat-Samii, Y. (1997). Low Profile Enhanced-Bandwidth PIFA Antennas for Wireless Communications Packaging, IEEE Transactions on Antennas and Propagation, vol. 45, pp. 1879-1888. Yang, F., Zhang, X.X., Ye, X., and Rahmat-Samii Y. (2001). Wideband E-Shaped Patch Antennas for Wireless Communications, IEEE Transactions on Antennas and Propagation, vol. 49, pp. 1094-1100. Yau, D. and Shuley, N.V. (1998). Numerical Analysis of An Aperture Coupled Microstrip Patch Antenna Using Mixed Potential Integral Equations and Complex Images, Progress in Electromagnetic Research, vol. 18, pp. 229-244. Zhang, X.-X. and Yang, F. (1998). The Study of Slit Cut on The Microstrip Antenna and Its Applications, Microwave and Optical Technology Letters, vol. 18, no. 4, pp. 297-300. Makale 22.04.2013 tarihinde alınmış, 19.11.2013 tarihinde düzeltilmiş, 25.02.2014 tarihinde kabul edilmiştir. ISNAD ERDEMİR, Sertaç , YILMAZ, Asım Egemen . "L1 Frekansında Çalışan E-Şekilli Mikroşerit GPS Anteni Tasarımı". 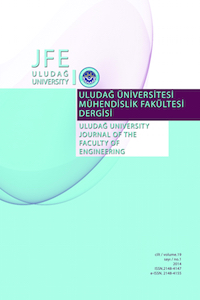 Uludağ University Journal of The Faculty of Engineering 19 / 1 (April 2014): 15-26.